Grammar Workbook is a grammar and composition workbook for students that are ready for an introduction to more advanced grammar. 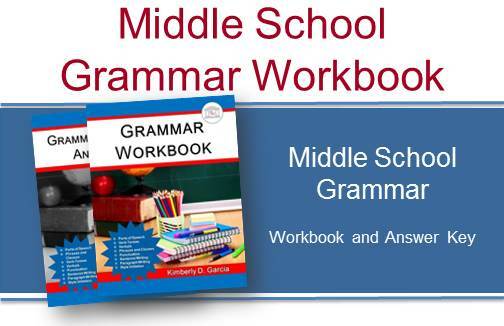 The text, Grammar Workbook, is divided into four sections. Section 1 covers sentences. This gives students a framework to study grammar. Section 2 covers the eight parts of speech. Section 3 covers clauses and phrases. Section 4 covers the basics of punctuation. In addition to teaching grammar, this workbook contains sentence and paragraph writing exercises. 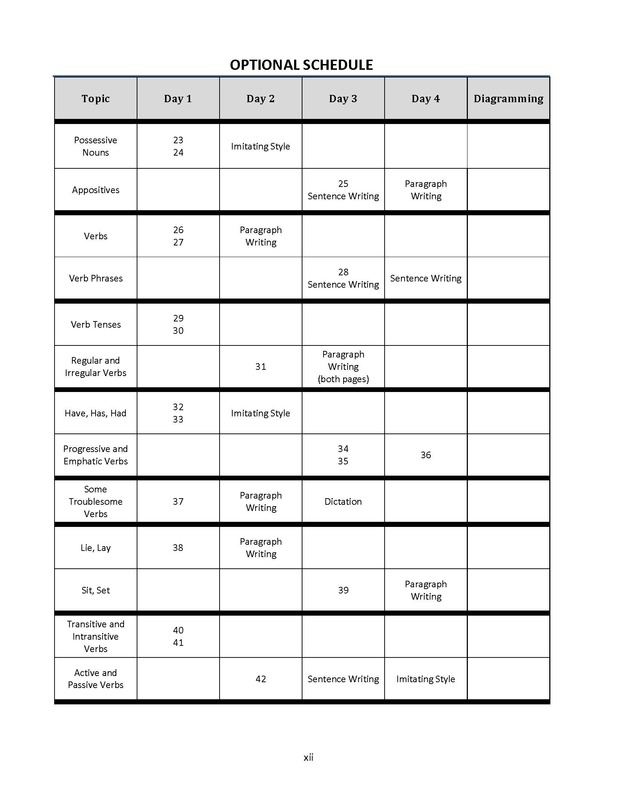 To provide students with diagramming practice, diagramming assignments from the textbook Diagraming Sentences are scheduled. 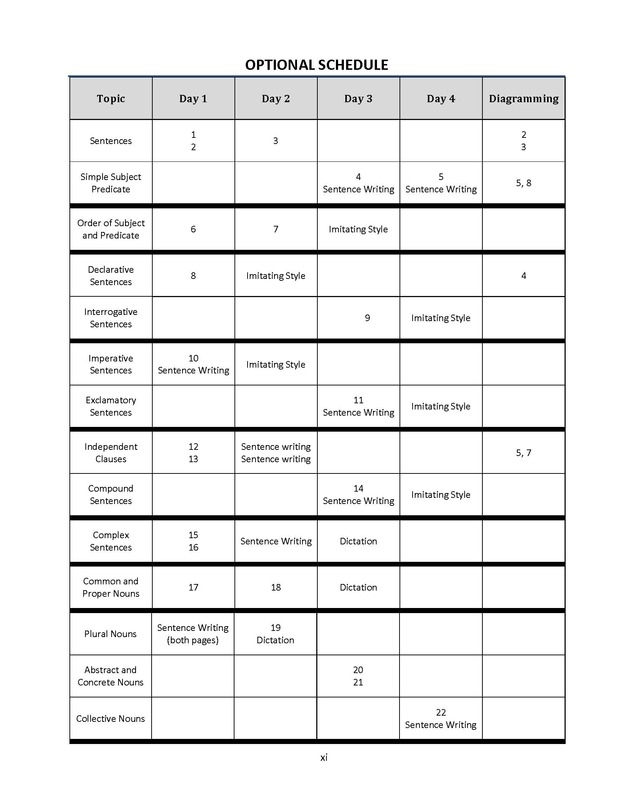 To provide your student(s) with diagramming instruction, the lessons in this workbook have been coordinated with the worktext Diagraming Sentences. (This link is an affiliate link. I really like this book. It has lots of white space, and has pretty good explanations. I did find one mistake that I marked in the grammar workbook, but overall this little book is great. By the way, the spelling is an alternative spelling. It’s not incorrect.) This 48 page book, available at amazon.com, provides students with simple, easy to understand directions that teach the basics of sentence diagramming. The answer key is included in the diagramming worktext. There are two types of writing exercises included in this grammar workbook. The first involves traditional sentence and paragraph writing exercises. 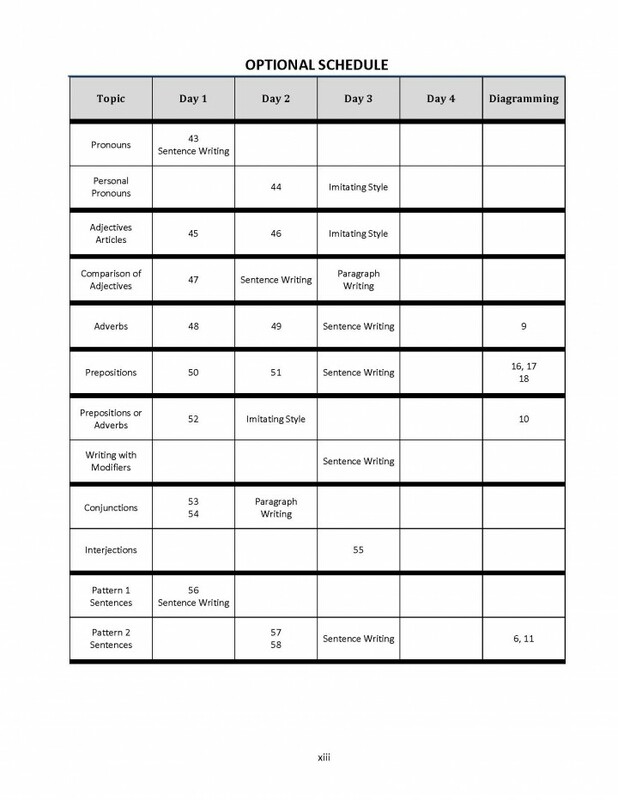 These require students to compose various types of sentences and paragraphs. modify the writing selection by altering the content but maintaining the style of the original model. Option 1: Have the student(s) copy the model. selection. The more passages students copy, the more their writing will improve. Option 2: Have the student(s) write from dictation. Review with your student(s) the spelling of any unfamiliar words. Review with your student(s) the punctuation in the passage. Erase the board and read the passage, one or two independent clauses at a time. You may start with two or three repetitions. The goal is for students to need only one reading of the sentence or clause to properly write it from dictation. Option 3: Have the student(s) recreate the model from memory or from an outline. Option 4: Have the student(s) rewrite the passage, altering the content but maintaining the style. The models selected reinforce the grammatical concepts taught throughout the lessons, giving students an opportunity to see grammar in action. To help teachers, an optional schedule is included in the text. 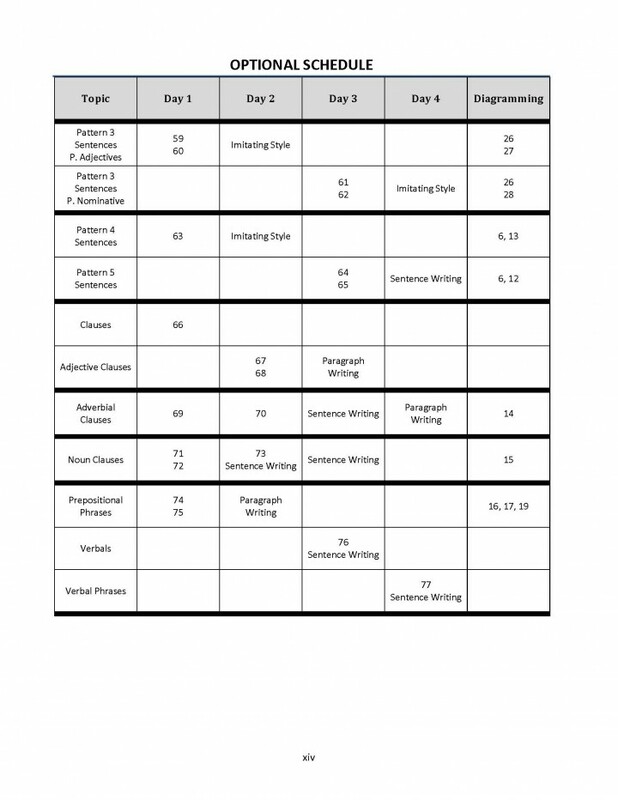 This schedule assumes students complete three days of grammar per week. Occasionally, some weeks schedule more than 3 days. Sometimes lessons will only require two days to complete. Those assignments have been paired with other shorter lessons. When that is done, the lessons are consecutive.